This daylong tour of Swan Valley stands out among other wine-tasting tours by offering a bunch of perks. 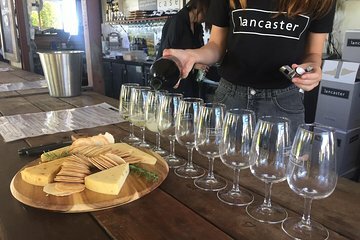 Sample local goods in addition to wine from four wineries: start at a coffee roaster for coffee, and then continue with chocolate and chocolate liqueur, cheese platters, beer, and more wine with lunch. Plus, see live entertainment on weekends and get umbrellas and sunscreen when you need them. Had the best time with our tour guide Kate. We were picked up at the train station about 10 minutes early. Our day was more adventurous they we had hoped. Started out with coffee tasting which was fabulous, very informative and lots of different coffees to sample. We went to several winery all of which treated us superbly with a good selection of wines. At our first stop, which was my personal favorite, we were treated to a huge cheese plate along with wonderful and generous pour of wines. Kate selection of venues was superb. Our lunch was more than we could eat and wonderful served in a beautiful setting. HIGHLY recomment this tour and KATE as your personal agent.